The colour, shape pattern and even layout of commercial flooring can have a high impact in the workplace. Whether it’s an open office or a relaxed leisure environment, the right feel is key. Commercial flooring options are varied, and there’s so much more to flooring than just picking a complementary colour or selecting a standard layout. Different shapes incite different feelings and moods, as do the colours that create them. Depending on your business and the room function, you’ll want to make sure that you pick flooring or carpet tiling that speaks the right tone. Using flooring design in the right way can change the spatial perceptions of the room as well as affect the mood of the people who enter it. A lot of the time, the focus of flooring and it’s psychology are centred around colour. Whilst it does have a great impact, the pattern and shapes used can have tremendous effects too. Squares and rectangles are used as a standard layout for most commercial floors. Used either to create rectangular block areas, a brick-like pattern or stripes, it’s a staple choice. Due to the fact that many things around us are squared with straight edges, it’s clear to see that it represents stability. Square shapes create a trusting and safe environment. Using large squared block areas, you can break up a large open plan office into areas and use colours to imply the use of that area. You can also create a block walkway effect from your entrance to help guide workers or customers, again adding to the feeling of safety. Using stripes in the right way can make a smaller square room feel longer as proven by the Helmholtz illusion. Triangles utilise the familiar safe straight edges of a square but have a more modern twist. It’s a unique dynamic shape, that exudes a sense of power and energy. 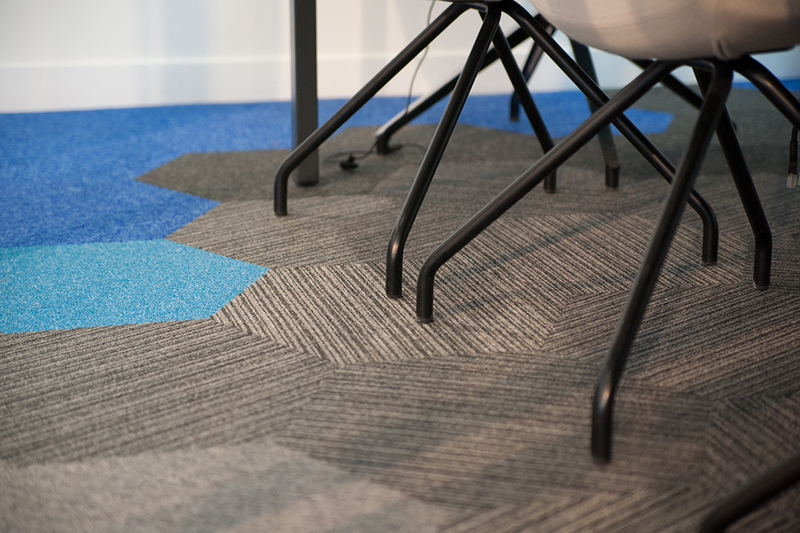 Due to their peak like shape, triangles also represent success so they are great for sales rooms, boardrooms or gym floors, where the shapes can energise and invigorate. Hexagons illicit thoughts of harmony. Although geometric, it is a shape existing in nature in bee hives so it makes sense that it would create a feeling of togetherness. Hexagon tiles (such as our Hexxtile range also embody strength due to their structure and can make spaces seem infinitely larger than they are. This shape would work well in communal rooms where you want people to be open and interact. The psychology of flooring can sometimes reach deeper than the layout, as even the flooring pattern can affect a space. The most popular patterns are natural ones. They geo-mimic in a unique way that creates a sense of calm and groundedness. From washed stone patterns through to replicated grainy wood (such as our Bark range ) these can bring the calmness of the outside world inside whilst boosting productivity. When you look to create your pattern, you do also need to consider the colours you want to use. If you are using multi tones, you’ll need to think about whether to use contrasting or complementary colours depending on the requirements of the room or building. Warm, neutral shades suggest comfort and safety so would work well combined with square and rectangular flooring. Bright and bold colours can be overwhelming, but when used correctly they can promote productivity and ignite a creative mind. Combining these colours with more modern, invigorating shapes such as triangles would be great for use in motivational areas. With a well thought out layout using patterns or inspiring colours, you can create a dynamic working environment, with your workforce or clients working with the design in a positive and responsive way.